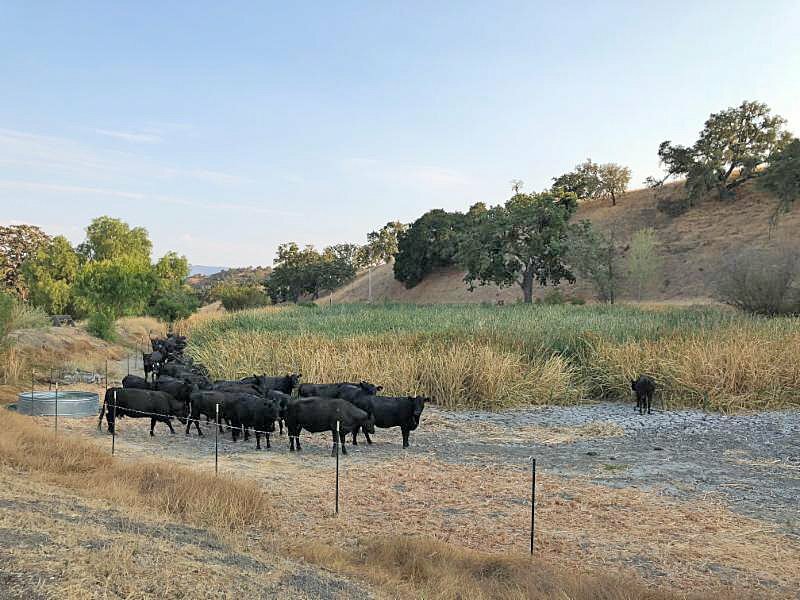 Cattle were used to graze down cattail stands to expand open water habitat at the Sedgwick Pond. Image courtesy Sedgwick Reserve. Many of California’s native species rely on human-built stock ponds for water. Impounding streams or low spots on the landscape, these ponds were built to supply cattle and other livestock. Now, however, they are often critical habitats for endangered amphibians and reptiles, as well as water-loving birds. The pond at the NRS's Sedgwick Reserve in the Santa Ynez Valley is no exception. 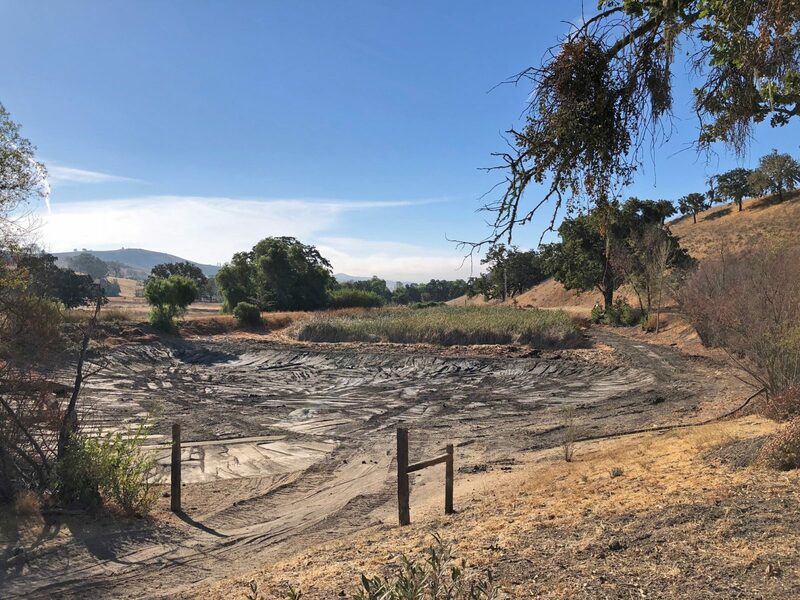 Built in the 1950s for ranch cattle, the pond is now home to Western pond turtles (a California species of special concern), California red-legged frogs (a federally listed species), and a nesting colony of tricolored blackbirds (a California listed species). With fewer cattail and less silt, the pond is now ready to be filled by winter rains. Image courtesy Sedgwick Reserve. To encourage native wildlife, the Reserve pumps well water to fill the one-acre basin during dry months. But in recent years, cattail has choked the pond basin. The plant’s spread has left less of the open water preferred by frogs and turtles. Cattail also consume a great deal of the precious well water. To make matters worse, soil from the surrounding basin and nearby hillside has been silting in the pond. By making the pond shallower, the extra sediment further reduced the open water area and encouraged cattail growth. The reserve has embarked on a restoration project to revive the open water habitat and reduce thirsty stands of cattail. The first step was to allow the pond to dry down over the summer. Not to worry: pond residents likely weathered this change just fine. Adapted to hot, dry summers, the native amphibians and reptiles likely headed upland to find refuge. Reserve staff even placed piles of brush outside the pond basin to provide extra shelter for the turtles. Then approximately 33 head of cattle were placed in the pond basin for one week in mid-August. Their grazing removed much of the cattail from the northern third of the pond. In late September, an excavator removed the silt from the open-water area. The final step: filling with winter rain. Adapted from the September 2018 issue of the Sedgwick Newsletter.